The Forward Editor is opened by pressing the button on the toolbar, or by right-clicking a message and selecting Forward from the context menu. 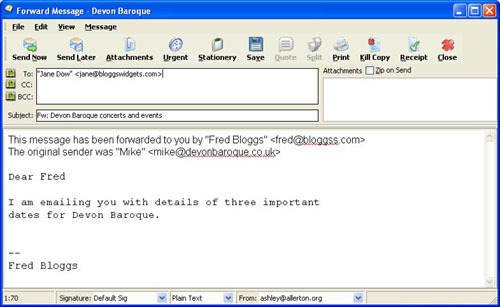 It is broadly similar to the Compose New Message Editor, to which you should refer for more detailed information. You may modify the message in any way you wish before sending it. The text of the message you are forwarding will be entered, with a preamble (which can be configured here) indicating its origins. The text of the message will not be marked with the quotes defined here, unless you have configured this in Configure Preferences Messages Editing.